Known as the "gateway to the Okanagan-Similkameen Valley", Princeton is situated at the confluence of the Tulameen and Similkameen Rivers, 135km (84 miles) east of Hope on Highway 3. 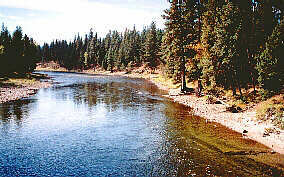 There are over 30 good trout lakes in the area where avid anglers may try their luck. Featuring exhibits of mining and farming equipment and pioneer, Salish and Chinese artifacts, this museum is located at 167 Vermillion Avenue. The History of "Princeton Castle"
The origins of the Princeton Castle date back to the year 1910, when it began it's life as the Portland Cement Plant. This industrial cement plant and powerhouse cost over a million dollars, and workers lives. It operated for just nine months, and then everything fell silent. Today, a project is underway to save the history and beauty of the Princeton Castle. Another twist that adds intrigue to this historic site is the appearance of Mr. George Edwards, who was actually Bill Miner, the notorious train robber. His hideout was on the hillside near Princeton Castle and some say unfound treasure is hidden there. Further along Highway 3 is Hedley, a once bustling mining town. Visit the Woodley Park or the Hedley Manor which displays mining artifacts. Keremeos is located at the junction of Highway 3 and 3A, just east of Hedley. Wood-fronted buildings (early 1900's) and a long, warm fruit growing season make this a comfortable, pleasant town. 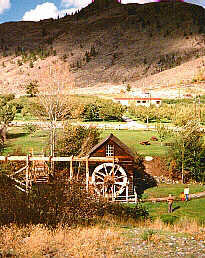 Now restored, it's the only water-powered grist mill in B.C. This winery produces its wines without preserves or sprays. Guided tours throughout the grounds are available. Continue east on Highway 3 through Osoyoos and onto Rock Creek. 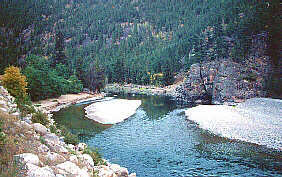 From Rock Creek head north on Highway.33 to Kettle River Provincial Park, the road to Big White Ski area and Kelowna.